PH1017984/94 Cancellation Accepted: Operating between Totnes, Corporation Road and Torquay, The Willows given service number MS3 effective from 10-Jan-2015. PH1017984/95 Cancellation Accepted: Operating between Dawlish, Port Road and Torquay, The Willows given service number MS1 effective from 10-Jan-2015. PH1017984/96 Cancellation Accepted: Operating between Kingsbridge Quay and Torquay, The Willows given service number MS2 effective from 10-Jan-2015. 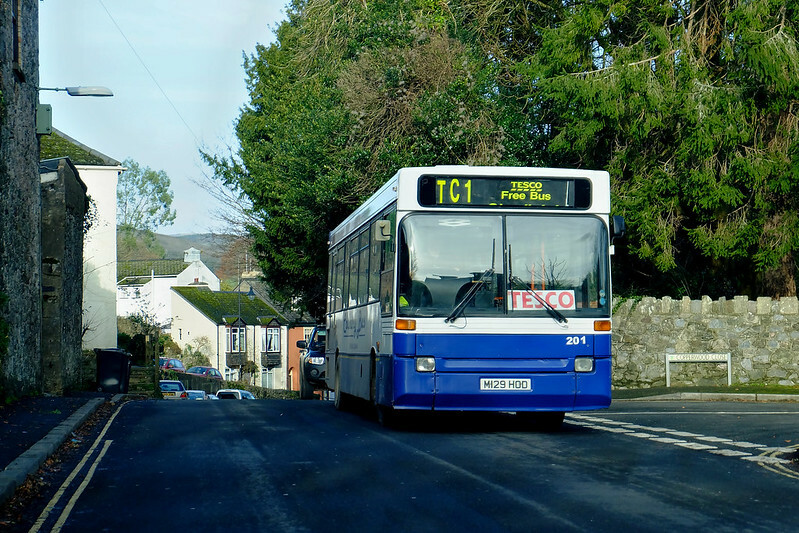 PH1017984/97 Cancellation Accepted: Operating between Chudleigh Memorial and Newton Abbot, Tesco given service number T5 effective from 10-Jan-2015. PH1017984/98 Cancellation Accepted: Operating between Paignton, Waterside Hotel and Newton Abbot, Tesco given service number T6 effective from 10-Jan-2015. PH1017984/99 Cancellation Accepted: Operating between Ashburton and Newton Abbot, Tesco given service number T7 effective from 10-Jan-2015. PH1017984/100 Cancellation Accepted: Operating between Teignmouth and Newton Abbot Tesco given service number T4 effective from 10-Jan-2015. PH1017984/101 Cancellation Accepted: Operating between Barton, Happaway Road and Newton Abbot Tesco given service number T3 effective from 10-Jan-2015. PH1017984/102 Cancellation Accepted: Operating between Dawlish, Carhaix Way and Newton Abbott Tesco given service number T1 effective from 10-Jan-2015. A familiar face on the Tesco contract just last week. Will this contract loss mean the end for 201? 05 JAN 2015 128 Poughill - Bude - Stratton A new timetable and a revised route between Bude and Poughill will be introduced on Service 128 from Monday 5th January 2015. 05 JAN 2015 X10 Exeter - Okehampton - Launceston Starting from Monday 5th January 2015 a new service, X10, will operate one journey each way from Mondays to Saturdays linking Launceston with Okehampton and Exeter. Additional daytime X9 journeys will run between Okehampton, Sticklepat, Whiddon Down, Tedburn St Mary and Exeter. Stagecoach have a few more changes registered from the 19th January which will be covered properly in the next Devon Transit. Routes affected include the X46, X64, 110, 13, 23 and GOLD. The GOLD service changes are particulary interesting so will be covered in more detail later this week in a post of their own. given service number 301 effective from 12-Jan-2015. 12 JAN 2015 301 Combe Martin - Ilfracombe - Barnstaple Quite what the changes are I have no idea as this information does not appear to be on the internet anywhere! Council taxpayers in Devon are subsidising some bus trips by nearly £20 for every individual passenger, it has been revealed. Now the county council is considering lowering caps on subsidies it will pay for bus journeys in Devon that would otherwise have been withdrawn by their commercial operators for being unprofitable. The ceiling will depend on the type of service and bigger subsidies are proposed for public transport which provides the last link for communities with bigger towns and for services which people use to get to and from work. Currently one subsidised Devon service costs £22.95 for every passenger trip while another bus journey costs £19.38. 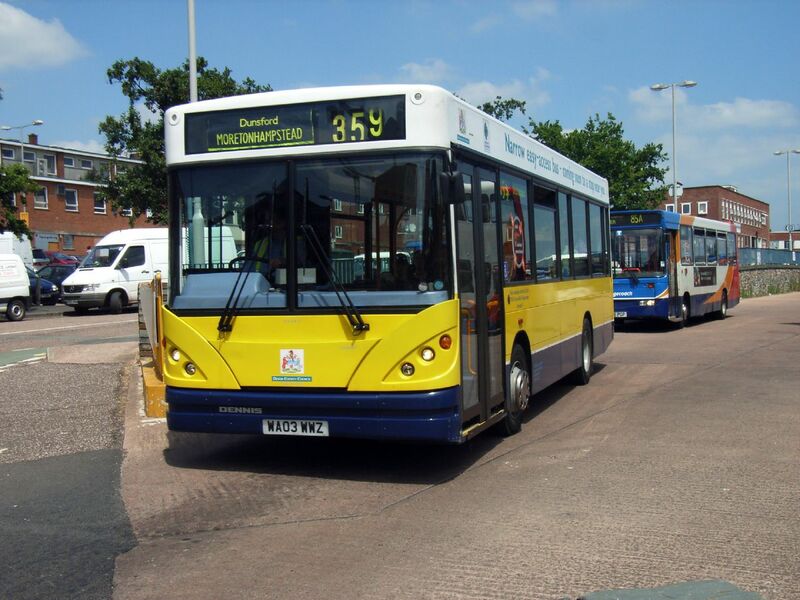 The measures are being proposed as the authority faces saving £1.7 million out of its annual bus subsidy as a way of meeting the £50 million county council budget reduction required by Government spending cuts next year. It will be the first time that the authority has been forced to make bus service reductions for four years. But it’s proposing to increase funding for volunteer-run, community transport providers which take people to health appointments, services, shops and leisure activities where no suitable transport is available. The county is set to launch a wide-ranging public consultation on which bus services are most valued by their local communities. Meanwhile the Cabinet member responsible, Stuart Hughes, has pledged that no communities which are currently served by a bus will be entirely cut off. Instead services which operate on a daily basis may be reduced to two or three days a week with similar reductions for less frequent services. The public consultation is scheduled to start this month. It will provide a complete list of all the services affected and enable people to identify which ones are most needed by their community. EXETER City Council has just published its draft Low Emissions Strategy and part of that is to “support bus operators to make improvements to their fleet and lower emissions”. Public Transport Experience: Mevagissey Mysteries  Getting There! M129HOD was used on a School Contract as part of the schedule which included the runs to Tescos so will be interesting to see. They have not many vehicles of that size having sold the Darts to Jacketts last year so will try and find out. I see Country Bus are still running this week on the Marks & Spencer contracts, which makes sense as Stagecoach don't start until next week. Interestingly they are also still running the Tesco contracts, and the route timetables are still displayed on their website. Filers 301, the B3230 is shut at Bittadon, as this bus normally operates via Muddiford & NDDH, and is on diversion (believe from Barnstaple on A361 via Braunton to Mullacott Cross, then A3123 to Two Potts), this timetable change simply removes all timing points between Two Potts & Barnstaple, as the bus is on diversion here, and appears to be until the 23rd March. They did similar change in past when road was shut around same area.